Inkblot Art Academy is a multiplayer stage in Splatoon 2. It takes place in the lot between two school buildings including a small park, parking lot, and campus pond. Inkblot Art Academy features two elevated areas by the Spawn Points that lead into the central area of the map. There are Water hazards on the side of the stage, and two hand-shaped statues that players can jump atop of. The Spawn point is set at the highest point and far edges of the map by the streets surrounding the school. Going to the right will lead to the greater portion of the map, going forwards will lead to a narrow alleyway which will drop down to one of the side gardens. The maps features many different levels and elevations with the area closest to spawn taking place between buildings. In front of the building leaving from spawn is a lot with a clam statue, the statue can be accessed from on top the building, the only way to access this lot normally is from an unikable ramp behind a wall to the corresponding team's right side. Beyond each team's statue lot is the main plaza which is a flat battle area with the main obstacle being the tall display at the center of the map which can be climbed on. To each teams left is a ramp leading tot he lower garden which possesses a tree and a block as obstacles. When in the opposing team's statue lot, there is a single wall on a building which can be inked to reach up and into the team's spawn area. The Splat Zone is located at the center of the map, both the area on ground level and on top of the display case will count towards the zone. 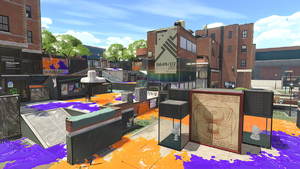 The only change made to the map is the inclusion of a single inkable block in the lower lot, creating an additional means of getting to the center of the map. The Tower is located at the center of the map in place of the display case. Two large inkable layered blocks have been added in the center of the map to both provide coverage and a vantage point. Additional ramps have been added in the lower lot for easier access back to the center map as well as two more prominent ramps in each team's statue lot which allow much easier access into each team's spawn areas. A block has been added to allowing another path into the opposing team's statue lot as well as another on the left going up the building. The tower will travel left around the wall, up the ramp into the opposing team's statue lot before going across the entire thing and finishing by going up the ramp and stopping in the parking lot in front of spawn. The first checkpoint is located between the wall in front of each team's uninkable ramp and the new block. The second checkpoint is located in the opposing team's statue lot. The Rainmaker is located at the center of the map in place of the display case. The goal is located in the parking lot in front of the opposing team's spawn. Much of the map is similar to Tower Control, the large blocks in the center of the map are present as well as all the ramps. The additional block that allows access to the opposing team's statue lot is removed but another inkable wall is added by the ramp in front of the unikable ramp. The basket on this map is located at the far back of the opposing team's statue lot. The map is fairly unchanged from Tower Control with the exception of the removal of the large ramps that allow easy access into the opposing team's spawn area. The platform block allowing a quick root into the statue lot has been expanded. The stage name is a reference to Rorschach tests, a psychological test that involves showing the subject an inkblot and recording their perceptions. During a Splatfest, the phones will ring periodically, followed by odd noises sounding like Inklings. They also sound similar to those of the Squid Beakon. The internal codename for this stage in the game files is "Upland". It is said by Pearl that Marina's and her outfit are designed by a graduate of Inkblot Art Academy, whereupon Marina wonders if she wrote her thesis on "ridiculously large zippers". Off the Hook has performed during Inkblot's music festival, during which Pearl broke a bunch of sculptures when she started a mosh pit. Inkblot is said to be one of Off the Hook's sponsors. Ama Bijutsu Daigaku Ama Art University. It is a parody of Tama Art University.